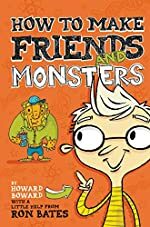 How to Make Friends and Monsters by Howard Boward. Review: Do you know how it feels to be oppressed? Well, Howard Boward, the main character of How to Make Friends and Monsters does, he experiences it every day. Being called How-Lame or How-Weird everyday by the UPs (the Uber Populars) doesn't feel good, until he becomes one because of an accidental experiment creating his powerful, giant, hairy monster named Franklin Stein that eventually becomes his best friend. Ron Bates wrote this diverting, attention-grabbing book. Howard Boward's journey from How-Lame to How-Cool is an incredible time for him. It is like a dream for him but how will it change his friendship with others? Howard Boward is a boy who hasn't always been a very popular person. He wants to be an Uber Popular. Just when you think that a nerd has no chance of being popular you are wrong. Howard decides to actually make a friend with animal DNA, wonder putty, and some weird chemicals. When Howard looks back at the blob, he notices it changing. In a few days, the blob turns into the giant but nice monster named Franklin Stein. Franklin and Howard become best friends, but getting popular gets to Howard, leading him to forget about him. Franklin feels double-crossed so he goes to live with Uncle Ben. When Howard asks to borrow Reynolds' phone he calls Uncle Ben and asks to talk to him. Franklin says 'hi' but he refuses to talk further. Then, Howard accidentally calls Crystal, who is a major gossiper. She over-hears that Franklin is a monster, and Howard tells her not to tell anyone. She wouldn't if he created a monster for her. He does, but Crystal tells the other UPs, and now, all of them want one. He makes them, but they want to give them back. He knows he can't care for giant animals, so he refuses. Then, the UPs bring Howard to The Palace, which is their hideout. What will happen to Howard? Will anyone save him? Read the book to find out! This book, in my opinion, was fantastic! I really liked how it's not realistic! I like books that have super-powers, monsters, aliens, and other fake things. Giant monsters are better than boring stories about history. I loved how they kept pushing the story further, instead of stopping it short. It would be interesting it if there was a sequel of this book; it would be great. What is great about this book is that it has a theme to it. It shows friendship is important. It also shows that you need to be loyal to people to remain friends. It also shows that people can change: good to bad, or bad to good. It doesn't matter if you have popular friends or not only the real friends matter the most. True friends stick with you no matter what. Some parts in the book I didn't like because they were confusing because Howard uses Reynolds' phone to call Uncle Ben, what I didn't get is, how does Reynolds have Crystal's number? He wasn't popular. This book's story line is really meant for boys. Most girls aren't interested in monsters, science, fires, and football, but most guys love those things. You should read the book if you like fictional things. This book isn't meant for serious people. I personally liked the storyline. It was action, sci-fi, and adventure. This book is one of the best I have read! A great audience for this book would be for kids around ages 9-12 because it is engaging, but it is also a long book to read. Or those kids who like to play with toy monsters, who like science, and whoever likes creating things. So, if you like any of those things, you should read How to Make Friends and Monsters by Ron Bates! Enjoy your journey! We would like to thank Zonderkidz for providing a copy of How to Make Friends and Monsters for this review. Have you read How to Make Friends and Monsters? How would you rate it?